In my opinion--which admittedly may not be worth all that much--the most important chapter ever written about how to effectively strike a golf ball was written by Bobby Jones. It was the second chapter of his book Golf is my Game, and described, according to Bobby, "the most useful learning you will ever acquire as a golfer." Bobby was not only a phenomenal player. He was also extremely intelligent and a keen observer. He observed other great players, and he observed average players who often struggled with the game. And Bobby believed he could actually help the average player. In fact, he believed that the information he was providing on how to strike the ball could literally "make you a better golfer overnight." "The unskilled golfer often looks uncomfortable, strained, unsure, sometimes even unhappy, but he hardly ever presents a ludicrous aspect. And I think that a great measure of his discomfiture is derived from his conscious efforts to follow prescribed routine, to look and move like someone else, or as he has been told. I think he would present a more natural appearance if he should put his mind upon striking the ball, rather than upon swinging the club." "Golf is played by striking the ball with the head of the club. 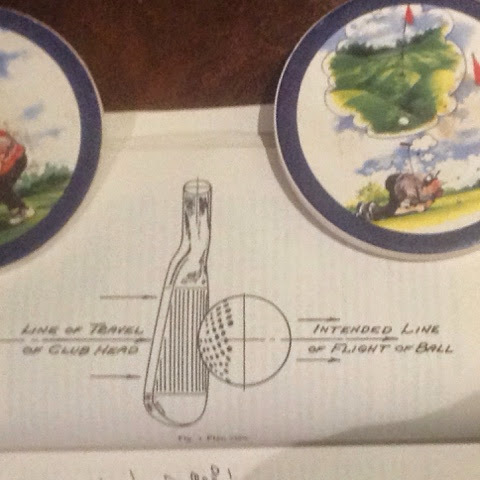 The objective of the player is not to swing the club in a specified manner, nor to execute a series of complicated movements in a prescribed sequence, nor to look pretty while he is doing it, but primarily and essentially to strike the ball with the head of the club so that the ball will perform according to his wishes." "No one can play golf until he knows the many ways in which a golf ball can be expected to respond when it is struck in different ways. If you think all of this should be obvious, please believe me when I assure you I have seen many good players attempt shots they should have known were impossible." Bobby Jones gave us a great gift in his books on golf. And this information in chapter two of Golf is my Game was the best of the best. This information can transform your game. 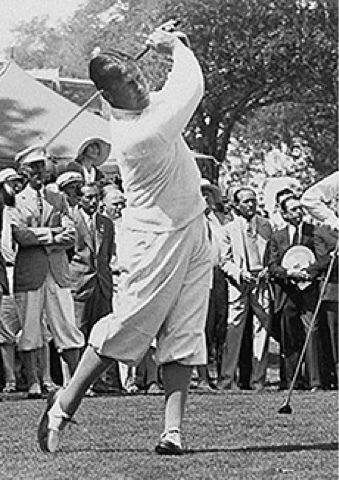 I have covered it in depth in my featured article called The Wisdom of Bobby Jones: Striking the Ball. If you haven't got a copy of Bobby's book, I invite you to check it out. To give you a recent example of the truth of what Bobby said, I recently played with a young man in Jacksonville. He was struggling with his driver, hitting big pushes, pulls, and slices. He had power to burn, but he was all over the place. Finally, I showed him how the driver face needed to strike the ball, square to his target and moving straight down the target line. I asked him to try to feel like the club was chasing the ball down the line for sixteen inches after impact, which is what Moe Norman said he did. I didn't expect him to keep the clubface square to the target and moving straight down the line for sixteen inches; I just wanted him to feel like he was doing it. When Sam Snead wanted to hit a big one, he said he also thought about having the clubhead chasing the ball down the line. The young man tried it and hit a drive that was a frozen rope, right down the middle of the fairway. We measured it at 310 yards. He hit several more just like it coming in. He didn't alter his swing, change his grip, which was an old-fashioned grip that featured a weak left hand and a strong right hand, or change his setup. All he did was focus on the club striking the ball in the only way that produces a straight shot. The results were immediate. I've seen similar results over and over again with myself and others. When you forget your swing and focus on the proper strike instead, good things happen. And yet, it's so tempting to go back to thinking about the swing. Golfers tend to be obsessed with the swing. Strange game, golf. Tiger Woods Greatest " By Far"?